"Deviled eggs with bacon and ranch dressing. Easy and tasty. I invented this recipe when I was looking for a new way to make deviled eggs. Week-old eggs peel easier than fresh eggs. You can use precooked bacon if you like. " They are really good, but I added some sweet relish to tone down the tangy ranch.But overall if you like Ranch and Bacon you will like these. I LOVE LOVE LOVE this recipe. 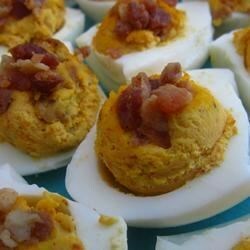 I am not a fan of deviled eggs in the least, however these were amazing!! I did add some Italian dressing as well. These were a rave for Easter Dinner!! Good, but I thought it was a tad bland with just ranch dressing and bacon, so I added yellow mustard, paprika, and salt and pepper. Made it a little tangy, which is good. Thanks for the recipe!